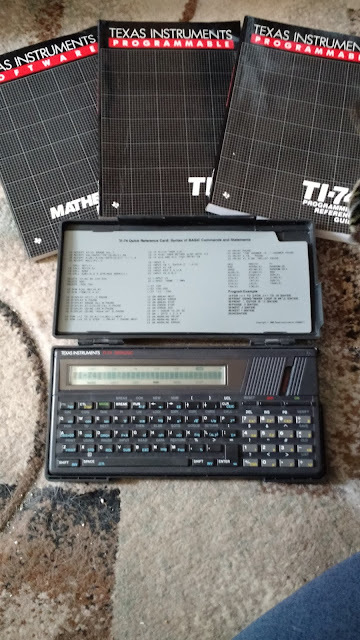 Recently I purchased a Texas Instruments TI-74 Basicalc calculator. The calculator came in great condition, including manuals and a Mathematics module (and the module). The TI-74 is a BASIC programming calculator (similar to Hewlett Packard’s HP-71B and HP-75 and Casio’s fx-795P). The keyboard of the TI-74 is very busy and has a QWERTY keyboard. The keys are nice but I am not able to type fast on it. The calculator takes four AAA batteries. The calculator I got was produced in 1985. 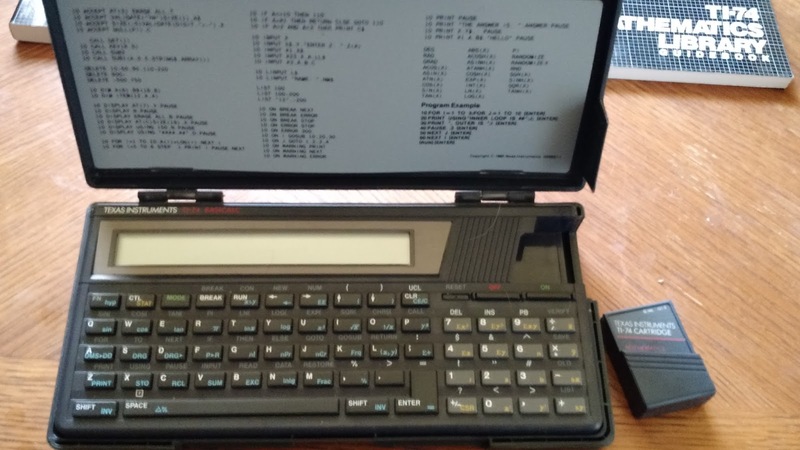 The original cost was around $130, which was a pretty good price for a basic portable BASIC computer/calculator at the time. 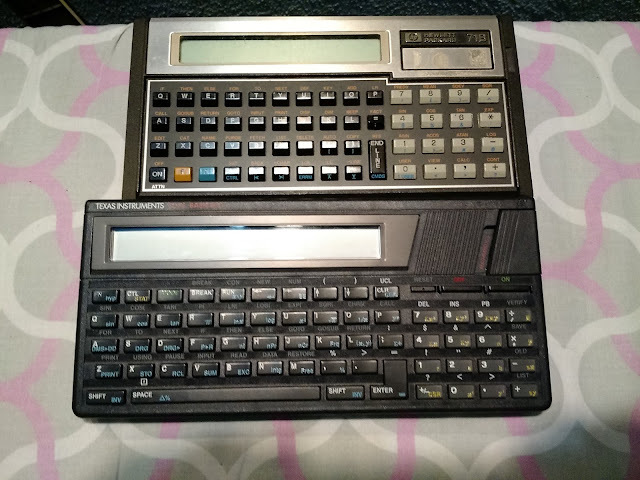 HP 71B (top) and TI-74 (bottom). The 74 is a giant! Modes are switched back and forth with the [ MODE ] toggle key. Like the HP-71B, the TI-74 has two modes: Calculator and BASIC mode. In Calculator mode, the QWERTY keyboard becomes a scientific calculator, with all the functions stated in blue. For example, the [ S ] key is the angle change key [ DRG ], while the [ U ] key becomes the square key [ x2 ]. In Calculator mode, the TI-74 operates as an AOS (Algebraic Operating System) calculator. If have worked with a TI-30Xa or a classic TI-36X Solar, you should be familiar with it. One of the quirks about the Calculator mode is how two argument functions are operated. For input, you will need to press [ (x,y) ] (the L key). Combinations and Permutations: Enter n, press [ (x,y) ] (L), r and press either [ nCr ] (J) for combinations or [ nPr ] (H) for permutations. Polar to Rectangular: Enter r, press [ (x,y) ] (L), then θ, [ P>R ] (F). x is displayed first, press [x<>y] (RUN) to show y.
Rectangular to Polar: Enter x, press [ (x,y) ] (L), then y, press [ INV ] (SHIFT), [ P>R ] (F). r is displayed first, press [x<>y] (RUN) to show θ.
Strangely enough, this isn’t the percent change function works. Enter the new amount, press [Δ%] (SPACE), then the old amount. For example, if I wanted to find the percent change from 150 to 180, I would key in 180, [Δ%], 150, [ = ] to get 20. (20% increase) This is also the same way of how to computer percent changes with the TI-55 III. The statistics module of the TI-74’s calculator mode can handle either one-variable date or linear regression (y = a + bx). You call statistical variables and clear its registers by first pressing the [ STAT ] (CTL) key. All the statistical variables are marked in yellow. By default, the TI-74 has 7,710 bytes of memory. You can add a memory module that would affectively double the memory. This is also where you can access any ROM module commands. The language of the TI-74 is straight forward. What is neat is that the case that comes with the TI-74 has syntax of the BASIC commands available card for reference. Make sure all the routines have END, that stops execution. The default case for the alpha keys in BASIC mode is lower case. To get the upper case lock, press [SHIFT] [UCL]. The only thing I am not crazy about is that the BASIC functions are printed in gray and it can be hard to see when holding the TI-74 at different angles. * Complex functions (COMPF): Arithmetic, Logarithms, Powers, Trigonometric, Parts of the Rectangular and Polar forms. This is really full-fledged, especially for complex numbers in the 1980s. The TI-74 can be attached to a compatible printer or a module that allows programs to be recorded on cassettes. On a side note… HHC 2016! I will be going to the HHC 2016 conference in two weeks (9/17 – 9/18/16) in Fort Collins, CO.
Hi, I just got this same calculator. But I have no manuals. I've been able to figure out a lot just by remembering how BASIC works, but, for the life of me I can run any of the programs on the math library rom module. I can type "CATALOG" and it will list the programs, but how do I run them? Also, would you consider scanning and sharing that documentation? It's not online anywhere. I would even be happy to pay you if you want to send me a photocopy. I have one with the math, statistics and pascal modules, but cannot find the manuals. Anyone know where they can be found?